There are very few in the music industry that compare to Patti Smith. Patti has excelled in everything, from music, writing and poetry, she has always been an iconic voice for the people, and has always rallied against the establishment to remind everyone to remain true to themselves. 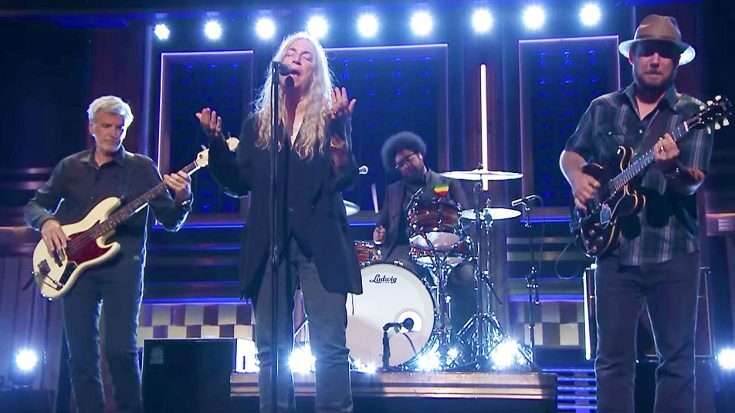 This week, Patti took her talent and message to the Tonight Show with Jimmy Fallon to promote her upcoming performance at Central Park to honor her late husband, and turned in a fabulous, anthemic performance of her classic hit “People Have The Power.” Her performance is inspiring, and any rock fan will feel uplifted after they watch it! Her message is powerful, and much needed during this day in age. Check out the awesome performance down below and let us know what you think!